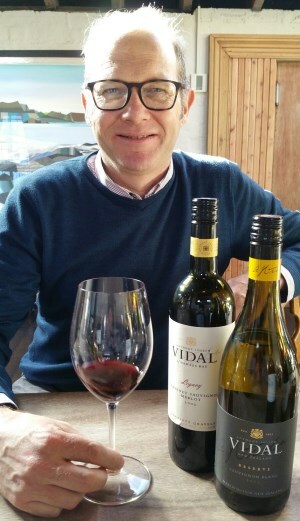 Vidal is synonymous with the Hawkes Bay region of New Zealand’s North Island, much celebrated as a red wine region for Syrah and Bordeaux varieties, but recently Hugh has placed a huge focus on Chardonnay too. “If I was forced to make only one wine from now on, it might be Chardonnay,” he says, stressing how much potential he believes Hawkes Bay has for the variety. “We are not bound by old appellation systems and history,” he says, “so you can ‘have a go’ at anything you want to, and that really encourages innovation. Wine making is science, and science is always changing, so wine should always be moving, and in New Zealand it is. As Hugh is on the board of their regional wine association he has been a big supporter of ‘more focus’. “In our big regional tastings we put on for press and the wine trade we used to show 24 wines trying to cover everything. Now we show eight Syrahs, eight Bordeaux Blends and eight Chardonnays. If people leave tasting eight truly great Chardonnays for example, it leaves much more of an impression than tasting eight different varieties.” Indeed Hugh’s 2012 Legacy Chardonnay won the Decanter trophy for best world Chardonnay. Vidal’s wines are imported by Hatch Mansfield Agencies. (2017) Vidal sources its Sauvignon Blanc fruit from Marlborough, from both estate-owned and contracted vineyards, primarily in the Wairau Valley "with a little Awatere fruit to give a little more tropical spectrum," says Hugh. Delicious nose, with lots of punchy passion fruit and tropical, lychee notes, plenty of peachy ripeness, and then the palate shimmers with acidity and so much intensity of flavour. (2017) The reserve has a higher percentage of Awatre fruit, and comes from the best vineyards, "and the same plots every year," according to Hugh. A rich, figgy character, with more orange and more of an asparagus lift, but a lovely racing palate, loads of lime and citrus Awatare purity and zip. (2017) Hugh didn't bring this to our tasting, but was so keen that I should try it that he sent me a bottle within days of our meeting. And I can absolutely see why: it may not come from the Legacy 'Grand Cru' vineyards, but what a terrific Chardonnay, the nose glittering with Chablis-like gunflint minerality, a lime precision and ripe apple beneath. The palate has surprising squirt of tropical, mango-like fruit ripeness, very juicy grapefruit too, then the mineral acidity starts to kick in, and a little creamy component, to give this texture and mouth-feel, the finish long and tapering in a most elegant way. (2017) From the range-topping Legacy line, this Gimblett Gravels Syrah spends 20 months in French oak, and only 10 barrels were produced. It has a savoury and intense, fairly brooding perfume, dark, liquoricy, with a hint of Morello cherry and delicate peppery lift. In the mouth the wine is firm and structured, again a rasp of plum-skin and liquorice bite, but there is just a hint of more ripe and fat berry fruit beneath, suggesting it's a wine that will need time. The oak is integrated and savoury, graphite and a touch of cedar, the firm, tight tannins and concentrated acid core running like steel to the finish. (2017) Only five barrels of this were produced. All red wines from 'Reserve' level upward are from Gimblett Gravels fruit, in this case two specific vineyards. It spends 20 months in French oak and is “Made like a Pinot Noir,” according to Hugh, hand-plunged, with a fair bit of post-ferment maceration for up to 40 days in total before pressing. "That gives plenty of tannin, but finer," says Hugh. A rounded, quite plush and compact nose, tight black and blue fruits, there’s a rich damson and graphite nose, an earthiness, not peppery but has a little floral lift. The palate has a cloak of dustiness, a really savoury meaty character, the tannins soft but present and the acidity giving it a long, tapering finish. (2017) Not all Gimblett Gravels fruit, so labelled 'Hawkes Bay'. The blend is 72% Merlot, 18% CS and "little bits of Malbec and Cabernet Franc." What a nice, attractive nose from an outstanding vintage, a “Vintage of a generation”, according to Hugh, that was "Phenomenally long, dry and warm, with no pressure" Lots of graphite, lots of light and gentle smokiness, medium-bodied, plenty of juicy cherry and orange, elegance and freshness and finesse into the long, textured finish. (2017) The Legacy blend is 76% Cabernet Sauvignon and 24% Merlot, and this wine was the first release in the Legacy series (which was not made again until conditions where right in 2013). The blend changes, and some vintages have been 100% Cabernet. Only 13 barrels, produced, the wine spending 20 months in French oak, around 50% new. Big, rich nose, immediately more plummy, with plenty of spice and tobacco, a gentle earth and leather note, but not dry, the fruit is there and the chocolate depth and plum comes through. Fine tannins, soft and with a raspberry ripple edge of creaminess, but fine acids and balance. This should still age nicely for a few more years too.